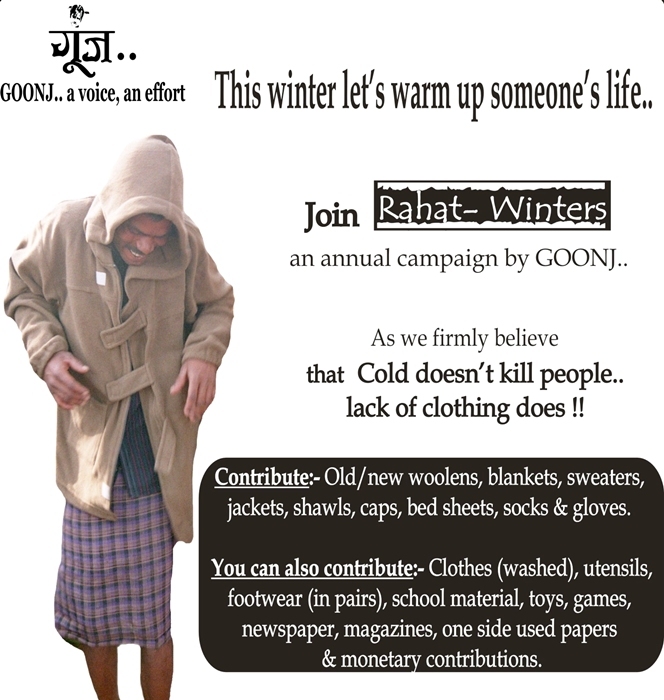 GOONJ.. (www.goonj.org) is organizing next “RAHAT-WINTERS” Collection camp in Dwarka on 23rd December’12 (Sunday), as per attached details. Contribute: Wearable old/new clothes, woolens, blankets, sweaters, jackets, shawls, caps, bed sheets, socks & globes etc. You can also contribute: clothes (washed), utensils, dry ration, sewing machine, Umbrellas, shoes, footwear, newspapers & magazines, one sided used papers, school material, books, old cycle, toys etc. and monetary contribution. Pls support, contribute, motivate others and spread message for a cause.